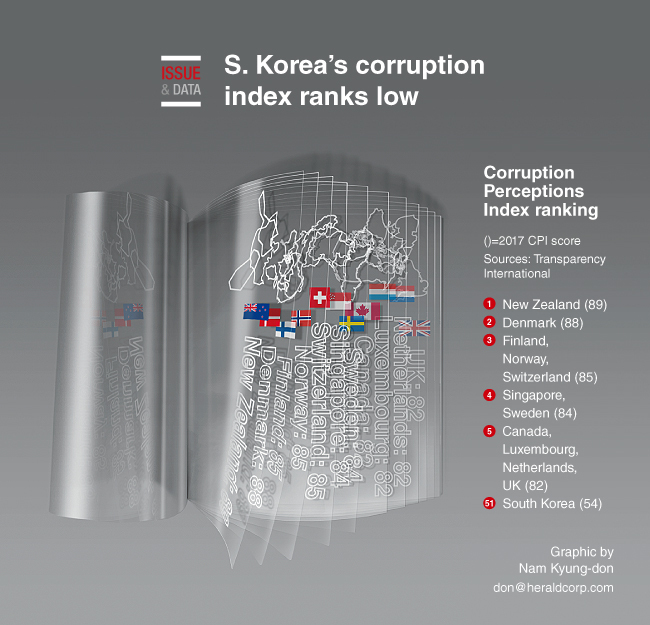 South Korea ranked 51st in the 2017 Corruption Perceptions Index report issued by Transparency International, up only one notch from a year earlier, when the ranking nosedived due to the influence-peddling scandal involving ousted former President Park Geun-hye. New Zealand topped the 180-nation list and Somalia ranked rock bottom. The United States came in 16th place, Japan in 20th, China in 77th and North Korea in 171st. The index evaluates countries based on how corrupt their public sector is perceived to be, using corruption-related data collected by governance and business experts. A score of 70 and above is considered generally clean, while a score of 50 and above means not entirely corrupt.